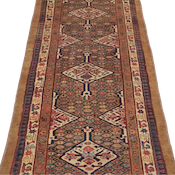 The best antique rugs and carpets utilizing undyed camelhair are quite rare, as they represent a limited production of just a handful of the rug weaving villages and tribal encampments of the mountainous district of Northwest Persia. Prized camelhair yarn, often spun from the wool of the weaver’s own camels, yields an exceptionally soft and glowing earth tone, and, like top quality sheep’s wool, it is very strong and resilient to wear. Color striations, known as abrash, yield a surprisingly wide range of earth tone hues from blonde, to wheat, to walnut, and even chocolate brown, greatly enhancing the aesthetic of this style of antique carpet. The major regions of origin were Persian Kurdistan and Azerbaijan. The most notable antique Camelhair rugs come from the towns of Bijar (Bidjar), Malayer, Serab and Bakshaish, and the surrounding villages. However, smaller remote villages and nomadic groups, especially Kurdish tribes people, the Persian town of Senneh, the Afshar tribe of Southeast Persia, and locales such as Kuba and Daghestan in the Caucasus Mountains, also employed this rare material. Occasionally, only the nomenclature “Northwest Persian Village” is used to define an antique Camelhair rug’s provenance, as its origin can be pinpointed only to the large wilderness territory north of Bijar (Bidjar) and south of Heriz. Most of the Camelhair rugs found on today’s market were woven circa 1910 to 1930, and are of considerably lower quality and less artistically inspired than the highly collectible antique Camelhair carpets that are sometimes found usually dating from 1850 to 1900. Camelhair antique Oriental carpets are typically found in area sizes ranging from 3ft x 5ft to 5ft x 7ft, and in runners, usually in sizes from 3ft x 9ft to 4ft x 16ft. Kelege (wide runner) sizes 4ft x 9ft to 6ft x 12ft are occasionally seen. Infinitely fewer pieces are found in room sizes, ranging between 7ft x 12ft to 10ft x 14ft, and extremely rarely found in the oversize format, where Camelhair carpets up to 12ft x 18ft were very seldom woven. Designs that are characteristic of this style include spaciously drawn geometric patterns which emphasize the soft camel color tones and subtle abrashes (color variations). 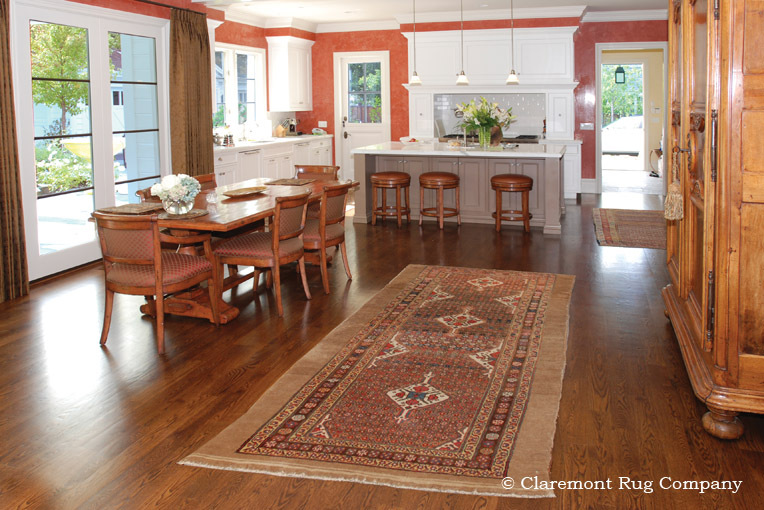 Often, a wide unadorned camel border frames the carpet, creating a “rug within-a-rug” look. 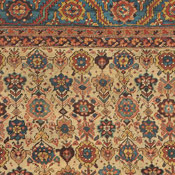 Classical antique carpet patterns include the use of a subtle geometric latticework that provides an intriguing background for the more outstanding primary motifs. Centrally located diamond medallions or repeating rows of diamond forms were favored, sometimes incorporating tiny animal forms and human figures. Individual totemic carpet designs were utilized as well. 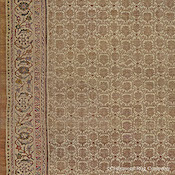 Antique Serab Camelhair rugs are especially popular for their grace and quiet sophistication, as they often feature a serene display of repeating overscale diamond medallions against a delicate honeycomb latticework, and offer a restrained palette of primarily earth tone and deep blue hues. The best Camelhair antique Serab carpets are extremely finely crafted, with unusually fine knotting and delicate lines for village rugs. 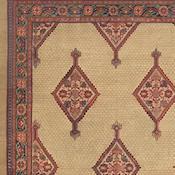 Antique Malayer Camelhairs may appear very similar to antique Serab rugs to the less experienced eye. 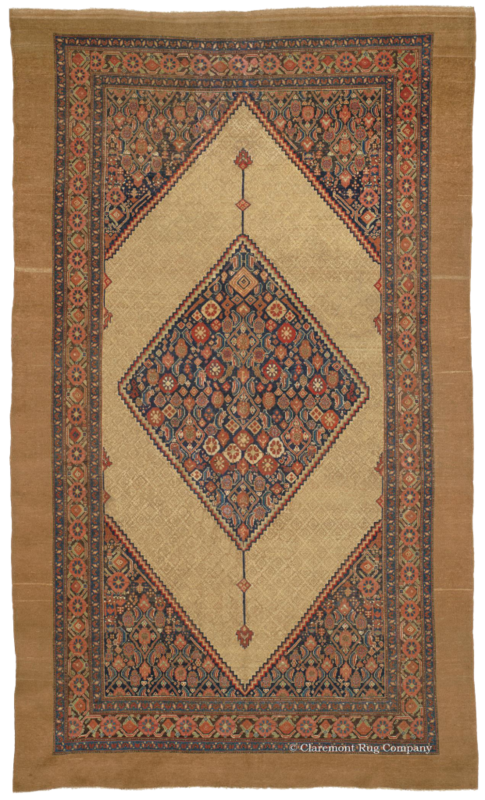 One identifying feature is that antique Malayer rugs often have a significantly wider palette than Serabs, with brighter rust and brick tones, and sometimes yellows and greens. They usually exude a lively, joyous ambiance. 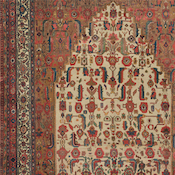 Close inspection shows that antique Malayer carpets often have a somewhat heavier weave than Serab rugs and are single-wefted, seen on the back of the rug as wider cotton bands between each row of knots. 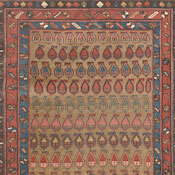 “Runners and keleges made in the village of Sarab and the surrounding area are highly prized by collectors … During the late 19th and early 20th centuries, Western tastes favored strong, deep colors, quite alien to the weavers of Sarab, who were partial to a soft palette, with camel as the primary color. 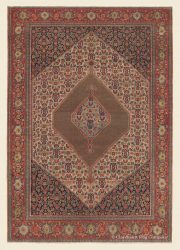 As a result, only a handful of these … pieces appear on the Western market.” (Middleton, Michael, Rugs & Carpets: Techniques, Traditions & Designs. Mitchell Beazley, London, 1996, p. 81). 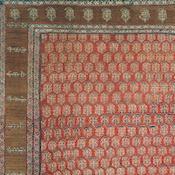 Bijar (Bidjar) Camelhair rugs often present grand visual presentations, with majestic medallions featuring broad anchor or rosette pendants extending at either end. Most often, the medallion will sit on a wide expanse of undyed camel hair or sheep’s wool that is completely unadorned except for the texture created by a delicate abrash of color. Like all antique Bijar (Bidjar) rugs, they were woven on a sturdy wool foundation, creating a particularly heavy, incredibly durable fabric. 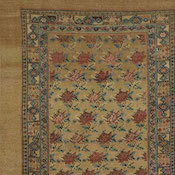 Top-level Bakshaish Camelhair carpets are the rarest, and the best pieces are incredibly prized. The most classical carpet pattern is a grand, intentionally asymmetrical center medallion, resting on a diminutive camelhair field, surrounded by broad cornerpieces containing either boteh or dragon motifs. Camelhair antique Bakshaish rugs offering spellbinding allover “Tree of Life” or “Garden of Paradise” antique carpet designs are also sometimes found, and are extremely treasured. As commercialization of the rug weaving industry in Persia increased in the 1920’s, with greater quantities of carpets being woven solely for export to the West, camelhair carpets, which were woven primarily for the weaver’s own use, were phased out for styles more desirable in the European market. Thus, antique Camelhair carpets of greater artistic integrity are seldom discovered on the market today. Clearly, with the exceptional beauty of the finest antique Camelhair carpets and their very limited availability, the collectability and investment potential of Camelhair rugs and carpets has increased substantially.  When they arise at auction, they typically command extremely active bidding. Also, as contemporary and traditional decors such as Tuscan feature soft golds, earth tones and golden browns as central color themes, Camelhair carpets are often sought after by the finest interior designers. Whether one is a collector, a connoisseur of fine art or prefers simply to satisfy their refined decorative sensibilities, top-tier Camelhair rugs and carpets will provide a lifetime’s enjoyment and prove to be superb art investments.